Qigong (Chi Kung) is a contemporary name for “Internal Work, ” which comprises a catalogue of Chinese health exercises and routines that date back hundreds of years. There are a number of ‘qigongs’—over 1000 of them!—some for very specific health issues, others for overall health-maintenance, some focusing on strength-building, others on relaxation or, even, meditation. But all of these rest on the three key concepts of body, breath and mind (intent.) 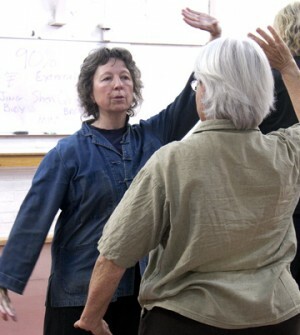 Controlling, training and regulating this trio is the goal of all Qigong practice. In this 6 week class, you will become conversant in these crucial ideas and movements.For those with no experience, this will be a first step in this precious practice. For those who have taken previous classes, this course will deepen and integrate the principles already encountered, and offer opportunities for further practice. Narrye Caldwell will be teaching this class. Narrye has been practicing Chinese medicine for over 25 years, and is a longtime teacher at Five Branches University. She has studied and taught Chinese martial arts—Tai Chi Chuan, Bagua Zhang and Qigong) for almost 30 years, and incorporates them into both her practice and her University instruction. The intimate relationship between Chinese martial and medical arts is beautifully drawn by Narrye, who both understands and can relate the traditional ties. This class will benefit both beginners and those who have had previous qigong classes, as well as those practicing Tai Chi Chuan.